NEW & IMPROVED CORDLESS MODEL - Now powered by a rechargeable lithium battery (no need for USB connection to operate), you can take your PRESSOPUMP with you wherever you go. PORTABLE and LIGHTWEIGHT it has now become an essential item for your travels. PLEASE NOTE - A USB CHARGING CABLE IS INCLUDED. NO PLUG IS REQUIRED. 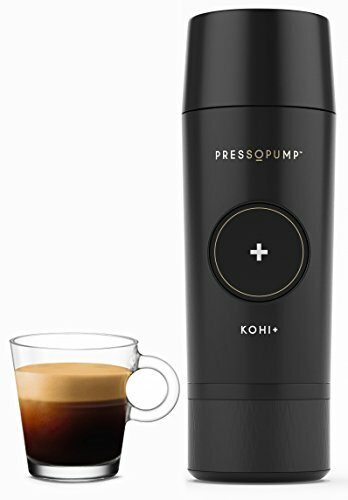 GREAT TASTING - The PRESSOPUMP prepares a Rich and Creamy coffee espresso shot, topped with THICK CREMA, all in under two minutes preparation. CUMBERSOME EXTRACTION ? - The Patented pump has been specially engineered to provide AUTOMATIC EXTRACTION generating up to 16 Bar pressure. At the push of a button your favorite coffee is extracted and liquid gold shoots out. It is also Leak-Proof and boasts a durable gasket ensuring long lasting use so it will not fail you when you need it most. Some call it the Minipresso on steroids! EASY TO CLEAN - Your PRESSOPUMP can be cleaned in minutes. All parts are easy to detach to ensure thorough cleaning unlike other portable coffee makers. CHEAP IMITATIONS COST YOU MORE - The PRESSOPUMP is made from high quality material (FDA Approved) and Lead-Free. Have a read of the customer reviews below and see what they think about the PRESSOPUMP. NOTE: We are not responsible for any defects if purchased elsewhere or cheap imitations are purchased. If you have any questions about this product by Pressopump, contact us by completing and submitting the form below. If you are looking for a specif part number, please include it with your message.